Have you or your group decided on a fundraising event or idea to help support Zimbabwean teachers expenses? Share what you are planning on Facebook, or add a comment on this blog. We have had 20 Zimbabwean teachers/performers apply and we cannot support all of them unless we have your help. At this point we can probably only support about 8 Zimbabwean teachers. Organizing committees are hard at work in the winter months preparing for our festival, as are individuals who are applying for visas for our guest teachers. We can support them and encourage their work by helping raise funds. The approximate cost of room, board and (max) travel for each Zimbabwean guest is $760. Our goal is to provide 10 Zimbabwean’s, transportation, room, and board with the help of these fund raising efforts. We encourage your participation to help make this successful, and let’s have some fun with the following ideas. Share your event on the Zimfest blog (post a comment) and on facebook so that we can see all the exciting events that are being planned to support Zimbabwean teachers at Zimfest. After your fundraiser event, please make checks out to Zimfest Association and mail them to Janis Weeks, 1960 University St., Eugene, OR 97403. Rubatano Center on Whidbey Island raised $500 for Project Kudzana at their Marimba Cafe on March 26! Special guests Simba Kamuriwo from Zimbabwe & Anzanga from Seattle helped rock the house! Way to go! Thanks so much to Rubatana Center, Simba and Anzanga! I would also like to name the groups who performed at Marimba Cafe to help raise funds for Project Kudzana…Moyo, Shamwari, Nyeredzi, Ka 1, and Mweya. It was fun night of music and dance. 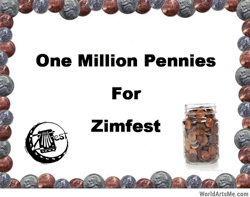 Sadza Marimba is donating $200 from their band fund to help bring our Zimbabwean friends to Zimfest. Another $300 was contributed by students and friends of the Singing Wood Marimba Centre at their recent Student Showcase, collected by their teacher, Laura Mallon. Santa Cruz, CA is happy to support Zimfest any way we can! Many thanks to Sadza and Singing Wood and all the Santa Cruz folks! Kuzanga Marimba is donating $200 from recent local playtimes, and Kelly Tyler of Kuzanga is donating an additional $150.